A term computer is derived from the word compute, which means to calculate. A computer is an electronic device that takes data and instructions as an input from the user, processes the data and provides useful information known as output. Input such as numbers, text, sound, image, animations, video, etc., are entered by the user in the form of data. Data refers to raw facts and figures. On receiving the data and instruction from the user, the computer processes the data and generates some output and displays it to the user. Processed data is known as information. (a) Input: Data collected and entered into the computer is called input. (b) Process: A sequence of actions per-formed on the data to get desired results is called processing. Analog computers handle or process information which is of a physical nature, as for example, temperature, pressure, etc. These are based on the measuring of analog or equivalent physical value. 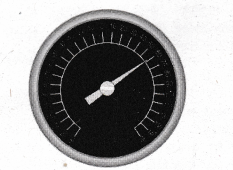 For example, thermometer and speedometer of car (See Figure 1.2). Digital computers process information which is essentially in a binary or two-state form, namely, zero and one. In computing terms, we mostly refer to the digital type of computers. Digital computers fall into different ranges called microcomputers, minicomputers, mainframes and supercomputers, which can be further classified in ascending order of size—small, medium, large and very large. The detail description of Digital computers are explain in later sections. A hybrid computer combines the desirable features of analog and digital computers. It is mostly used for automatic operations of complicated physical processes and machines. For example, in hospital’s ICU (Intensive Care Unit), analog devices might measure the patients temperature, blood pressure and other vital signs. Speed: A computer is a very fast device. A modern computer can execute millions of instructions in one second. Accuracy: In addition to the speed, computers are very accurate. If the entered data and instructions are correct, then the result produced will be accurate. Storage Capacity: Computers can store huge amount of data. To give you an idea of storage capacity, a single CD (Compact Disk) can contain an entire movie and played in a computer any number of times without any failure. Diligence: A computer is free from monotony, tiredness, lack of concentration, and hence can work for hours together without committing any error. Versatility: Computers can perform repetitive jobs efficiently. Computer does what it is programmed. If the program given is not designed properly, then the results may be wrong. Computer has no capability to think and find out the results based on its past experience unlike human. Computers have no feelings and no instincts because they are lifeless machines. The history of computers starts as far back as 5000 BC. The history of computers starts with the development of a calculating device called Abacus around 3500 BC by the Chinese. It consists of a rectangular frame carrying a number of rods or wires. It was used to perform simple arithmetic operations (See Figure 1.3). The first mechanical adding machine was invented by Blaise Pascal in 1642. This machine was further improved by Baron Gottfried Wilhelm von Leibniz of Germany in the year 1671. The original idea of using successive addition for multiplication was use¬ful for developing the multiplication calculator by Leibniz (See Figure 1.4). Charles Babbage was a leading mathematician of his days. Even as a student, Babbage began working on what he called a “Difference Engine”. his was a mechanical engine using gear wheels and their interplay, to mechanize the production of final values in a mathematical table. The basic principle in the Babbage difference engine was that of using the level difference, between values computed for a formula. The analytical engine used the principle developed by Charles Babbage. Babbage difference engine exploited these procedures in a gear wheel mechanism. However, it was the first step in the automation of computing that led Babbage to leap forward into the next development. A machine of this type was adopted by insurance companies for computing life tables. Dr. Herman Hollerith was a statistician with the U.S.Bureau of census. He designed a set of machines to help in processing the result of 1890 census in U.S.A. He used 3″ x 5″ punched cards to record data. He constructed a box to arrange data in a particular order, that was finally fed to an electromagnetic counting machine for tabulation (See Figure 1.6). The punch cards devised by Herman in 1887 underwent changes and around 1920, the International Business Machines (IBM) introduced a particular type of card, the design of which was used in some organizations for a very long time. 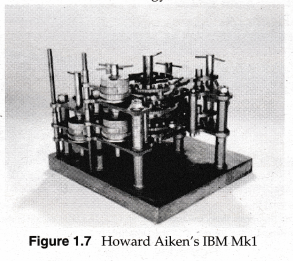 First computer capable of automatically performing a long sequence of arithmetic and logical calculations was built by Howard G. Aiken in conjunction with the International Business Machines (IBM) (See Figure 1.7). This computer was called the IBM Mark 1 which could multiply two digit numbers in 5 seconds. Prof. Aiken also developed punched paper tape as an input medium. All these machines were based on electromechanical devices. These machines used relays for making and breaking connections. These were mechanical devices and were not very reliable. Moreover, these machines consumed a large amount of electrical energy. Main problem of electro-mechanical devices was overcome in the year 1946 when the vacuum tubes were used for the first time in large sized computer. 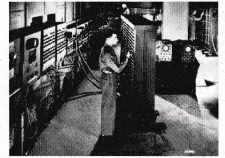 This machine was named as “ENIAC” a short form for Electronic Numerical Integrator and Calculator (See Figure 1.8). This machine was thirty times more powerful than the earlier machines. It contained about 18,000 electronic valves. It could perform 5,000 additions per second and consumed 150 kilo watts of power. This model remained in use till 1955. Eckert and Mauchly established a new company in 1946. This company was incorporated as the UNIVAC Division of Remington Rand in 1949. 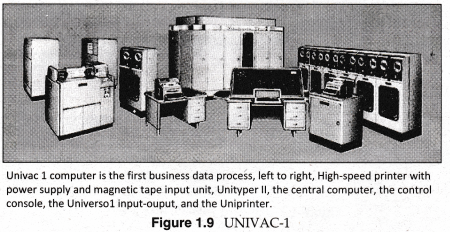 The first machine, UNIVAC-1 built by this company was made operational in 1951 at the Bureau of Census. This machine used magnetic medium for data input and output. It was so rugged that it could be run for 24 hours a day and worked successfully till 1963. A similar machine was produced in bulk and put to business applications in 1954. These machines are known as the first generation computers. These computers used valve technology and had the main limitations of heavy power consumption and not very high reliability (See Figure 1.9). Computers are classified into different generations based on the technology used. The computers of this era were huge, very expensive, slow and had limited application capabilities. Since the size of computers was very large, they used to consume large amount of electricity and generated large amount of heat. The computers that fall under the first generation of computers are ENIAC, EDVAC (Electronic Discrete Variable Automatic Computer) and UNIVAC. These computers were used for scientific calculations. Each computer had a different binary-coded program called a machine language. In second generation, vacuum tubes were replaced by transistors. The transistors were faster and more reliable than vacuum tubes. The size of the transistors was smaller than vacuum tubes and they generated less heat as compared to vacuum tubes. They replaced machine language with assembly language. The programming languages like COBOL (COmmon Business Oriented Lan¬guage) and FORTRAN (FORmula TRANslation) came into use during that time. Some of the second generation computers were UNIVAC III, IBM 1401, etc. They were smaller in size as compared to the second-generation computer. New input and output devices came in the market. They used operating system that allowed them to run different programs at the same time. Examples of third generation computers include IBM 360 series and IBM 370 series. They use microprocessors, a type of Very-Large-Scale Integrated Circuits (VLSIC), which contain all the components of a CPU on a single chip. These computers were smaller and cheaper than the computers of previous gen-erations. They were more reliable than the third generation computers. The fourth generation of computers used high level programming languages, which allowed a program written for one computer to be easily executed in another computer. They can be networked to share storage capacity, space and data. The fifth generation of computers is characterized by Ultra Large Scale Integra¬tion (ULSI) technology. It is more powerful as well as faster than microprocessors used by the computers of the fourth generation. Fifth generation computer involves Artificial Intelligence (AI) which aims to create computers that perform various operations and at the same time take decision similar to human beings. With the use of artificial intelligence, computers can hold conversation with its human operators and can learn from its own experience. The fifth generation computers are referred to as supercomputers. Application examples of fifth generation computer are intelligent systems that could control the route of a missile, Word processing that could be controlled by means of speech recognition, programs that could translate documents from one language to another. Example of supercomputers PARAM was developed by CDAC (Centre for Development of Advanced Computing) in Pune (India). Tianhe-IA is the latest and the fastest supercomputer. 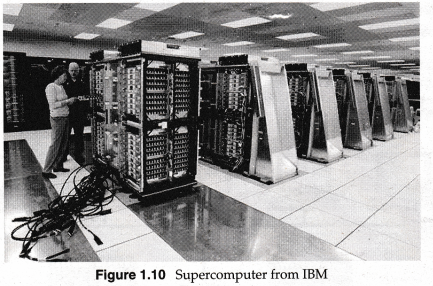 Supercomputers are large, extremely fast and expensive computers. (See Figure 1.10). They are being used at some research centres and government agencies involving sophisticated scientific and engineering tasks. Based on the concept of parallel processing. Many small computer chips work simultaneously to perform millions of arithmetic operations per second. They are used for massive data processing and solving very sophisticated prob¬lems. They are used for weather forecasting, weapons research and development, rocketing, aerodynamics, seismology, atomic, nuclear and plasma physics. Examples of supercomputers are: PARAM developed by CDAC in Pune (India), HITAC S-300 (32 gigaFLOPS, Hitachi make), HITAC S-300, IBM Roadrunner (1.105 PFLOPS), Cray Jaguar (1.759 PFLOPS). Tianhe-IA is the latest and the fastest supercomputer. It boasts a speed of 2.507 petaFLOPS, (1015 FLOPS). 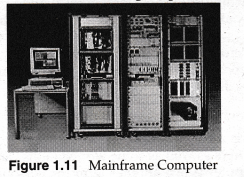 Mainframe computers are very powerful, large scale general purpose computers. They are used in research organizations, large industries, business and govern¬ment organizations, banks, hospitals, insurance companies, railway and airline reservations (See Figure 1.11). Supports a wide range of peripherals and have large storage capacity. Examples of mainframe computers are: IBM 4300 series IBM 308X series (large models), IBM 3090 series, HP 9000 model 870S/400, HP 9000 Model 870S/300. Latest mainframes computers are IBM zSeries, System z9 and System zlO servers. It offers two levels of virtualization, logical partitions and virtual machines. A minicomputer is a small to medium-scale computer used widely for data pro¬cessing and in industrial applications. Minicomputers are used for payroll preparation, accounting and scientific com-putation. Minicomputers are also used in universities, industries and research centres. Workstation is a powerful stand-alone computer of the sort used in Computer Aided Design (CAD) and other applications requiring a high-end, usually expensive, machine with considerable calculating or graphics capability. Workstation is also used to refer to a minicomputer or terminal connected to a network. Just like PC (Personal Computer), it is used by only one person at. a time, but it is several times more powerful than a PC and has larger disk space and high reso¬lution graphics display monitor. A desktop computer is a computer that fits conveniently on the top of a business desk. Most personal computers as well as some workstations can be considered desktop com¬puters. 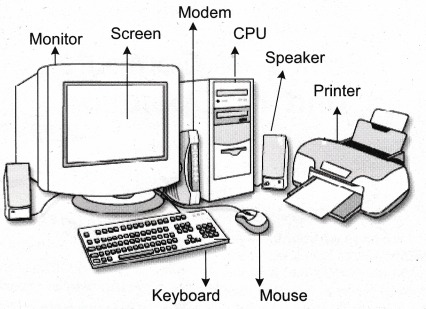 Desktop computer is just another term for personal computer (PC) (See Figure 1.1). They are replacing minicomputers and workstations slowly with their powerful hardware and sophisticated software available at very low price. Handheld or mobile computing devices are small, compact and portable devices used typically by those people who work in a mobile environment, such as delivery services, utility companies, salesmen, travelling businessmen, etc. (See Figure 1.13). It allows people to effectively communicate and interact with the fixed organizational informa¬tion system, wherever they themselves may be located. A laptop PC is a small, compact and portable machine which runs on battery power. You can unfold it and work with it on your lap and hence the name. It can be carried in your suitcase easily. It is comparatively costly and is mainly used by senior executives or correspondents who mostly remain on tour. 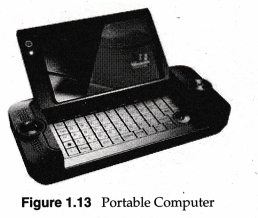 Figure 1.14 depicts a laptop model. Personal Digital Assistants (PDAs) is a handheld computer and popularly known as a palmtop. It has a touch screen and a memory card for storage of data (See Figure 1.15). PDAs can also be effectively used as portable audio players, web browsers and smart phones. Most of them can access the Internet by means of Bluetooth or Wi-Fi communi-cation. Wearable computers can be worn on the body and are often used in the study of behav¬ior modeling and human health (See Figure 1.16). Military and health professionals have incorporated wearable computers into their daily routine, as a part of such studies. When the users’ hands and sensory organs are engaged in other activities, wearable computers are of great help in tracking human actions. low powered, demanding PC applications may not provide an ideal experience to the user. Apple computers has come out with a refined second-generation tablet iPad 2 that squeezes more power into a thinner shell. An embedded computer is a combination of hardware and software. But, it forms part of a larger system and is designed to perform only a specific function. A PC is designed to perform many kinds of jobs like preparing a letter, chatting with friends and also for doing computations at a faster rate. 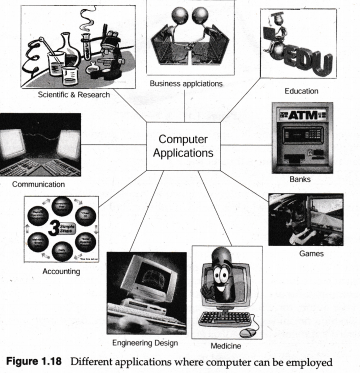 But, in contrast, an embedded computer does only a single type of job, for which it is designed. Embedded computer forms a part of auto¬matic washing machines, microovens, electronic watches, cellular phones, thermostats, industrial equipments, and medical equipments. A computer is a general purpose tool, which can do a variety of jobs. You can use a computer for different application by changing various kind of software packages. Business: It is used for budgeting, accounting, billing, reporting, presentations etc., in business. Medicine and Health Care: It used for diagnosing illnesses, monitoring patients and surgery, etc. For example, medical students learning surgery can practice operations on computers through virtual reality. Communications: It is used for communicating to different parts of the world. For example, you can send e-mail to your friends and relatives who live in dif¬ferent countries. Education and Reference: Computers are effectively used in classrooms, museums and libraries. For examples, in classrooms, computers are used to develop science projects, prepare reports, etc. Scientific Research: Computers are used in research centers and laboratories. They help in maintaining all the results efficiently which can be quickly accessed or retrieved when required. Banks: Today banks are the first large organizations to invest heavily on com¬puters. Complete book keeping of the bank accounts is done by the computers. Information about deposit, withdrawal, interest charges, etc., are managed by computers. Government: Computers are also used by government for various things, such as railway reservation, airways reservation income and tax processing, etc. Games: You can play games for hours on computers. Games can be both enter¬taining and educational. Electronic Publishing: DTP or Desktop Publishing is a new field created because of efficient use of computer. Nowadays, newspapers are designed using DTP in different parts of a country and printed at one place and distributed so that we can get them every morning. Inputting : Refers to the process of entering data into the computer with the help of an input device, such as a keyboard. Storing : Refers to the storage of data and instructions in the computer’s main memory for manipulations. Processing : Refers to performing operations (both arithmetic and logical) or manipulation of data entered into the computer so that useful information may be gathered from the entered data. Outputting : Refers to the process of showing the information or result to the user either on screen (monitor) or on paper (through printer). Controlling : Refers to directing all the above processes, in coordination. This copteyling is done by the Control Unit (CU) in a Central Processing Unit (CPU). The internal architectural design of computers differs from one system model to another. However, the basic organization remains the same for all computer systems. 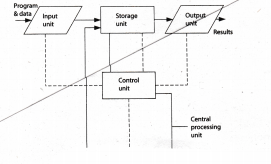 A block diagram of the basic computer organization is shown in Figure 1.19. In this Figure, the solid lines are used to indicate the flow of instructions and data and the dotted lines represent the control exercised by the control unit. It depicts the five major building blocks, or functional units, of a digital computer system. These five units cor¬respond to the five basic operations namely inputting, storing, processing, outputting and controlling performed by all computer systems. Each of these units is described in succeeding sections. A CPU is the brain of a computer. Its primary function is to execute programs which are the set of instructions given in computer high level language. Beside executing pro¬grams, the CPU also controls the operation of all other components, such as memory, input and output devices. Under its control, programs and data are stored in the memory and outputs are displayed on the monitor screen or printed on paper, once the processing has taken place. Primary memory or the Main memory unit is one of the major parts of a computer (See Figure 1.19). It holds data which is currently manipulated by the CPU. Since Primary memory is present within the CPU itself, it is also known as internal memory or RAM. The ALU is like the heart of computer. ALU of a computer system is the place where the actual execution of instructions takes place. All calculations are performed and all com-parisons (decisions) are made in the ALU. All ALUs are designed to perform the four basic arithmetic operations-add, subtract, multiply, divide, and logic operations, such as less than, equal to or greater than. Figure 1.20 illustrates organization of a computer system containing different parts and subsystems. 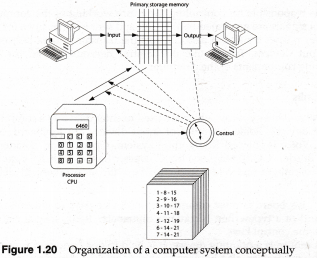 In this Figure, the calculator represents the central processing unit (CPU) and the clock carries out the control function for different operations of the computer. The input and output devices are shown for the keyboard input and the monitor output. Figure 1.21 shows a block diagrammatic representation of an ALU. The data which is entered in the accumulator is returned to the main memory through the storage register. The data present either in the storage register or in the accumulator may be transferred to the adder for the required operation. After an operation has been performed, the result is stored back in the accumulator. An accumulator is a register in which interme¬diate and logic results are stored. This data can be transferred to the memory or any other register by using appropriate instructions. The logical comparisons, such as “equal to”, “less than”, “greater than”, etc., are performed by the comparator. A combination of ALU and Control Unit is known as a microprocessor. This unit is responsible for controlling the entire working of the computer. The timing and control signals are generated by this unit and sent to other units for execution of the program for proper control. It also controls the transfer of data between memory and input/output devices. It acts like our central nervous system for the other data- manipulating components of the computer. Keyboard : Keyboard is most common input device used to enter data. It is similar to the keyboard of a typewriter. It contains alphabets, digits, special characters, function keys and some control keys. Mouse : A mouse is a pointing device. It is held in one hand and is moved across a flat surface. The mouse can also be used to draw sketches, diagrams, etc., on the monitor screen. It is also used to edit text on the screen, the cursor can be quickly placed close to the desired point of the screen by moving the mouse. Scanner : Scanners are a kind of input devices. It is a device that scans images, printed text, or an object and converts it into a digital image. Scanners can be used for storing photographs and important documents in their original form. Joystick : A joystick is also a pointing device. It is used to move the cursor position on a monitor screen. Its function is similar to that of a mouse and is used for playing games. The joystick can be moved right or left, forward or backward. Optical Mark Reader : Optical mark readers are special scanners used for recognizing a pre-specified type of mark made by pencil or pen. For example, in the objective test paper of competitive examinations, you mark your answers on a special sheet by dark¬ening a small square or circle, using a pen or pencil. Bar Code Reader : Bar code readers are special devices used to read bar coded data. Bar code is a specialized code used for fast identification of items. It consists of a series of small lines, known as bars. Smart Card Reader : A smart card is a plastic card about the size of a credit card. It has a microchip that can be loaded with data. The data loaded in microchip can not be read visually so they are ideal for storing confidential data. It can be used for electronic cash payments and other applications. A special kind of machine called smart card reader is used to read the data loaded in smart cards. Optical Character Reader : Optical character readers is technique for inputting text into a computer by means of a document reader. OCR originally required specially designed character, but current devices can recognize most standard typefaces and even hand¬writing. OCR is used, for example, by gas and electricity companies to input data col¬lected on meter-reading cards, and by personal digital assistants to recognize user’s handwriting. Magnetic Ink Character Recognition : MICR detects the special encoded characters on bank cheques and deposit slips. After detecting the encoded characters, the MICR con¬verts them into digital data for the computer. Biometric Sensor : Biometric is the science and technology that usually refers to meth-odology for measuring and analyzing human body characteristics that is unique to an individual. Biometric sensor is the device that is used to identifies fingerprints, DNA identification, eye retinas and irises, voice patterns, facial patterns, hand measurements, face shape and signature verification. Trackball: A trackball is also a pointing device and contains a ball which can rotate in any direction. The user spins the ball in different directions to move the cursor on the monitor (See Figure 1.22). The associated electronic circuitry detects the direction and speed of the spin. The information is sent to the processor. This type of pointing device is normally used in a laptop computer. Light pen : A light pen is a pointing device. It is used to select a displayed menu option on the monitor. It is a photosensitive pen-like device. It is capable of sensing a position on the monitor screen when its tip touches the screen. When its tip is moved over the screen surface, its photocell sensing element detects the light coming from the screen and the corresponding signals are sent to the processor. Web Cameras : A Web camera allows a computer to accept input just by focussing on an object (See Figure 1.24). The camera is focussed on the input object to take a picture of the object. Picture so taken can be transferred over computer network to a distant place. Microphones : A microphone, which was originally invented by E-mail Berliner in 1877, is a device which allows you to record voices or sounds and place them onto computers, generally as a wav file. Microphones can also be used with other applications, such as a voice dictation program or a voice conference program. Touch Screen : It is a computer monitor screen designed or modified to recognize the location of a touch on its surface. By touching the screen, the user can make a selection or move a cursor. Touch screens are very popular in applications, such as information kiosks and Automatic Teller Machines (ATM). Graphic Tablets : It is an input device used to create graphics. It is commonly used in Computer Aided Design (CAD) terminals. Graphic tablet is also used to enter digital signatures. It is a flat surface which can be kept on a table. A stylus (an electronic pen) is provided with the tablet. Output unit is a unit of a computer system that supplies information and results of computation to the outside world. Monitors : Monitors comes in two types. Let us discuss each of them in brief. CRT (Cathode Ray Tube) Monitor: A VDU (Visual Display Unit) or CRT monitor is very similar to a television and its size (as in the case of TV) is measured in diagonal length of the screen. Monitors are available in 12″, 14″, 15″, 17″, 19″ and 21″ size. It shows text or picture in colour or black and white, depending on the type. Colour monitors are more costly than black and white monitors. Whatever you type on the keyboard, you can see it on the monitor. Figure 1.25 shows typical CRT monitor. *. TFT-LCD (Thin Film Transistor-Liquid Crystal Display) Monitor: LCD monitor is the flat panel type of monitor found on notebook PCs. TFT-LCD (thin film transistor liquid crystal display) is a variant of liquid crystal display (LCD) which uses thin film transis¬tor (TFT) technology to improve image quality. TFT-LCD is one type of active matrix LCD. It is used in televisions, flat panel displays, projectors, etc. Figure 1.26 shows TFT-LCD monitor. Printers :Printers provide information in a permanent readable form called hardcopy. They produce printed outputs of results and programs. The printers can be classified as Impact printers and non-impact printers. Impact Printers: These type of printers use an electro-mechanical mechanism, that causes hammers or pins to strike against a ribbon and paper to print the text. Impact printers are slow, noisy, and cheaper. The impact printers are further classified into the following categories: Line printers and Character printers. Line Printers : A line printer prints one line of the text at a time. Printing speeds may vary from 300-3000 lines per minute. Different types of line printers are-Drum printer and Chain printer. Drum Printer: A drum printer consists of a cylindrical drum on which characters are embossed. One complete set of characters is embossed for each and every print position on a line. The drum is rotated at a high speed. There is a magnetically-driven hammer in each character position of the line. A character is printed by striking a hammer against the embossed character on the surface. Chain Printer : A chain printer uses a rapidly, rotating chain which is called print chain. Magnetically-driven hammers are located in each print position. To print a line, the characters in the line are transmitted from the memory to printer buffer. The band is rotated at a high speed. With the rotation of the band, a hammer is activated when the desired character comes in front of it. Thus, for a printer with 132 characters per line, 132 hammers will be positioned to strike the ribbon. The noise level of the printer is high and its speed lies in the range of 400-2400 lines per minute. Character Printers (Serial Printer): A character printer prints one character of the text at a time. They are low-speed printers. Their printing speed lies in the range of 30-600 characters per second. Different types of character printers are-Dot-matrix printers and Letter quality printers. Dot-Matrix Printer : A dot-matrix printer is the most popular serial printer. The prin¬thead contains a vertical array of pins. As the printhead moves across the paper, selected pins fire against the ribbon to form a pattern of dots on the paper. A dot-matrix printer is faster than a letter quality printer. Letter Quality Printer: These printers print full characters, which means that a character is not made up of dots. The most common popular printer of this type is daisy-wheel printer. The daisy wheel printer has a speed up to 90 characters per second. Non-impact Printer: This type of printer use thermal, chemical, electrostatic, laser beam or inkjet technology for printing the text. Usually, a non-impact printer is faster than an impact type. These printers are categorized as Electromagnetic printer, Thermal printer, Inkjet printer, Laser printer. Let us discuss each of them in brief. Electromagnetic Printer :This printer uses magnetic recording techniques. By using this technique, the required output is written on a drum surface. Then this surface is passed through magnetic powder which adheres to the charged areas. The powder is then pressed onto the paper. Thermal Printer: This type of printer uses a special heat-sensitive paper. These papers have a special heat-sensitive coating. When a spot on the paper is heated, it becomes dark. A character is printed with a matrix of dots. Ink-Jet Printer: Inkjet printers are more efficient than dot-matrix printers. The inkjet’s printhead has many tiny nozzles that spray ink into the paper. Each nozzle is thinner than human hair. It use a continuous stream of ink drops to print characters on paper. The print quality is good because the character is formed by dozens of tiny ink dots. These printers produce better quality of text and graphics and are faster. Laser Printer : Laser printers are non-impact type printers. They print one page at a time. These printers use laser or other light source to produce an image on a photosen¬sitive drum. The computer controls the laser beam to turn it on and off. An image is produced following the raster scan principle. The laser-exposed areas attract toner (an ink powder). Thereafter the drum transfers the toner to the paper. The paper then moves to a fusing station where the toner is permanently fused on the paper with heat or pres¬sure. After this the drum is discharged and cleaned. Now the drum is ready for pro¬cessing the next page. Plotters : Plotters are output devices. They are used to produce precise, and good qual¬ity graphics and drawings under control of the computer. They use ink pen or inkjet to draw graphics or drawings. Either single colour or multicoloured pens can be employed. Ligure 1.25 shows a plotter. Multimedia Projector: Multimedia projector is an output device connected to a PC and used to project information from a computer on to a large screen (a cloth screen or wall). It is widely used for giving presentations. Audio, video, image and animation can be prepared on a PC and using a multimedia projector the presentation can be made more lively and interesting. Speech Synthesizer : Speech synthesizer is an output device that converts textual data into spoken sentences. This device finds wide applications in treating blind or dumb people. Text information can be read out to the blind people using the speech synthe¬sizer. All computers except very small systems contain both semiconductor as well as mag¬netic memory. The semiconductor memory is employed as the main memory (or primary memory) of the computer. It stores programs and data which are currently needed by the CPU. The magnetic memory is used as secondary (or auxiliary) memory. You cannot store data in the main memory of a PC permanently. Firstly because it is very expensive and secondly its contents are erased when the computer is turned off. In order to preserve or save the work which you have done on your computer (perma¬nently for future use) before you shut it off, you need storage media, such as floppy disks, compact disks (CDs), pen drives and hard disks. Boot means start or make the computer system ready so that it can take instructions. The word “boot” comes from “bootstrap,” since bootstraps helps you to get your boots on; likewise booting the computer helps it to get its Read Only Memory (ROM) instructions loaded in its main memory. In a PC, there is a small bootstrap program in a ROM chip that is automatically executed when the computer is switched on or reset. The bootstrap routine searches for the operating system, loads it and then passes control over to it. Cold Booting : When the computer is first switched on, it is called cold booting. When the computer is already ON and is being reset because it is struck up due to some rea¬son, then it is called warm booting. Warm Booting With personal computers using single tasking operating systems, it is , usually necessary to reset the computer after it crashes. For example in IBM PC compat¬ible machine, you can do the warm booting by pressing the (Ctrl), (Alt) and (Del) keys together. In this way, it will not do initial checks like memory checks etc. which it will do when it is switched on for the fist time. Distinguish between analog and digital computers. Analog computers handle or process information which is of a physical nature, as for example, measuring temperature, pressure, etc. Digital computers process data which is essentially in a binary or two-state form namely, zero and one. Presently, we use PCs which are digital computers. What is a mini computer? How is it different from microcomputer? 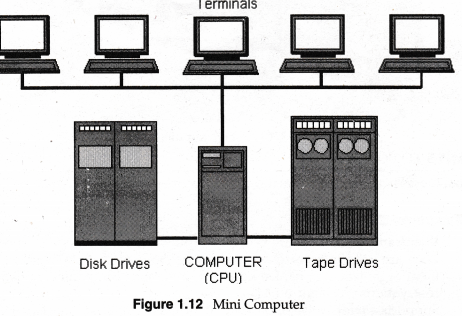 A minicomputer is a small to medium-scale computer that is the mid-range between a microcomputer and a Mainframe. It can support from a handful up to several hundred user terminals. They are designed as multiuser systems and operate in a multi-terminal environment. Minicomputers are extensively used for payroll prepa¬ration, accounting and scientific computation. High-performance workstations with graphics input/output capability use minicomputers. Where as a microcomputer is a low-cost, small, digital computer. It contains a microprocessor unit, a memory unit, and is equipped with an input device and an output device to constitute a complete computing system. What do you mean by computer memory? Explain the two types of memories used in a PC. Primary Memory: Memory which is directly connected to the microprocessor forming a CPU in PCs. Secondary Memory: Memory which is external to CPU and is a permanent nature. How can you say that the CPU is the brain of the computer system? A CPU is the brain of a computer because its primary function is to execute pro¬grams. Beside executing programs, the CPU also controls the operation of all other components, such as memory, input and output devices. Under its control, programs and data are stored in the memory and outputs are displayed on the monitor screen or printed on paper, once processing has taken place. What is the difference between web camera and video camera? A web camera allows a computer to accept input just by focussing on an object. The camera is focussed on the input object to take a picture of the object. Picture so taken can be transferred over network to a distant place. Whereas a video camera is a camera that takes continuous pictures and generates a signal for display on a ^monitor or for permanent recording. Signals generated by video cameras are traditionally analog, but nowadays digital video cameras are available. Is it right that the motherboard is the main component of the system unit? Explain the term booting a PC? Boot means start or make the computer system ready so that it can take instructions. The word “boot” comes from “bootstrap,” since bootstraps helps you to get your boots on; likewise booting the computer helps it to get its Read Only Memory (ROM) instructions loaded in its main memory. When the computer is first switched on, it is called cold booting. When the computer is already ON and is being reset because it is struck up due to some reason, then it is called warm booting. Differentiate between dot-matrix printer and a laser printer. Dot matrix printer is a type of impact printer. These printers print characters on the paper by striking the paper with a print head and using an inked ribbon present between the print head and the paper. Print quality produced by a dot-matrix printer is not very good but they are low-cost printers. Printing speed is low and noise level is very high. Laser printer is a type of non-impact printer. These printers print the characters without engaging the print mechanism with the print surface. These printer use laser beam technology. Laser printers are quiet and produce high-quality output, but they are expensive. These printers are faster than dot-matrix printers and they print one page at a time. Control Unit is responsible for managing and coordinating all the activities of the computer system. CU obtains instructions from the program stored in the main memory, interprets the instructions and issues signals that cause other units of the system to perform their functions. All the electronic components in a system are mounted on a piece of fiberglass called the motherboard. Fiberglass is used because it is a non-conductor of electricity and hence various components remain insulated from each other. Thin metal lines on the fiberglass connect pins from one component to another, forming the computer’s electrical circuits. A microprocessor executes all the program instructions and is truly the heart of the personal computer. It consists of a silicon chip on which tiny circuits are engraved through a photochemical process. These chips are available in differ¬ent types and sizes. Some common types are Intel P4, Athelon etc. What is the difference between impact and non-impact printer? Impact printers use an electro-mechanical mechanism that causes hammers or pins to strike against a ribbon and paper to print the text. Two types of impact character printers are available: dot-matrix printers and letter quality printers. Non-impact printers do not use any electro-mechanical printing head to strike against ribbon and paper. They use thermal, chemical, electrostatic, laser beam or inkjet technology for printing the text. Usually a non-impact type printer is faster than an impact type. The disadvantage of non-impact type printers is that they pro¬duce only a single copy of the text whereas impact printers can produce multiple copies of the text. What is MICR device and how does it impact on businesses? MICR is used by the banking industry for faster processing of large volumes of cheques being handled every day by banking industry. MICR detects the special encoded characters on bank cheques and deposit slips. After detecting the encoded characters, the MICR converts them into digital data for the computer. MICR technology speeds up data input for the banks because cheques can be directly fed into the input device and automatically processed thereafter. Besides enabling faster processing of cheques, this technology also ensures accuracy of data entry because most of the information is pre-printed on the cheque and is directly fed to the computer. What is a secondary storage? How does it differ from a primary storage or memory? Secondary memory is a computer memory that is not directly accessible to the central processing unit of a computer. It is non-volatile memory. Secondary memory is used to store large volume of data on permanent basis. You cannot store data in the main memory of a PC permanently. Firstly because it is very expensive and secondly its contents are erased when the computer is turned off. That is, main memory stores data and instructions only temporarily. In order to pre¬serve or save the work which you have done on your computer (permanently for future use) before you shut it off, you have to use storage media such as pen drives, compact disks (CDs) and hard disks etc. Write any two characteristic of fourth generation computers. These machines are much faster, less expensive and have greater data processing capacity than equivalent sized third generation computers. These computers use advanced techniques to feed data, and to bring out processed data for use of the outside world. They can even be connected with the satellite communication links to transform information from one part of the world to other part of the world at a very high speed. These machines use advanced application software packages, such as process controllers, computer aided design (CAD), electronic spread sheet (Microsoft Excel) and Relational database management (Oracle 9i). Which one of the following is not an impact printer?